“Professional Engineers Ontario (PEO) hired David Irvine as our Leadership Navigator and Moderator for the PEO 2017 Volunteer Leadership Conference. I am normally the most critical one with regards to how well the organizing committee did their job for any given conference. This year however, I was really impressed with how well the material is fitting in to our programming and theme. I believe in a baseball analogy, David Irvine “brought his A game” to the VLC and had “knocked it out of the park” in terms of his performance as Leader’s Navigator. Very impressive! I have received numerous comments from my volunteers in attendance citing what great job David did moderating, how relevant were his material and how adaptive David was as a speaker. François Laurin, Executive Vice President - Information Technology, Sobeys Inc.
Gerry Labossiere, Chair, AIS Inc.
Maureen Kewley, Managing Director, The Crossing at Ghost River Ltd.
Ed Rodenburg, Former President & CEO, Lilydale Inc.
Ray Nelson, Founder, Nelson Lumber Company Ltd.
Doug Sherman, CEO, Pharmasave Drugs (Ontario) Ltd.
“Accountability is one of today’s greatest business issues. Fortunately I have been introduced to David Irvine and have benefited first hand from his remarkable insights into not only how to be accountable, but why. He and his organization embody what it means to be accountable and they have been fantastic to work with. David’s work with staff and independent advisors has been warmly received, and has supported positive change. Patricia J. McNeil, Manager of Operations, Caisse Horizon Credit Union Ltd.
“While attending the Credit Union Central of Alberta Annual General Meeting event, I had the good fortune to attend your presentation called “Deep Accountability; The Power of Agreement. Thirty years ago, I made the commitment to always pursue a continuous learning strategy for self improvement, believe me when I say; I have attended my share of presentations. Your presentation made the hair on the back of my neck stand up! In a relaxed fun environment you brought a clear, concise, understanding of living a life built on the principles and philosophy of accountability, the mind set required to achieve this and the tool needed to make it happen. WOW…it is a small world, and you have continued to touch people and contribute opportunities for affirmation and to create opportunity for significant life changing impacts on people. “Accountability agreements now exist between the firm’s partners, directors, team leaders and project managers, and are reviewed at least once per year on employees’ employment anniversaries. David Irvine’s accountability process, which has now replaced the outdated ‘job-description/employee performance’ models has, without question, been wholeheartedly and enthusiastically endorsed by the participants. It has led to a higher degree of respect between them relative to their individual and collective business goals within Marshall Tittemore Architects. “When I heard David Irvine say that leadership is a personal choice, I had a hunch that his messages would resonate with FCC’s leadership team. I was right. David Irvine is an inspiring teacher and a dynamic speaker. With insights grounded in personal experience, David’s messages about authenticity, accountability and balance are both practical and profound. “We asked David to speak to our District Leadership Council on Authentic Leadership as part of our Fall Leadership Conference. David made an immediate impression with all our district leaders and it was evident that he had spent time researching and doing his homework on our organization. From the outside looking in, you’d think that David had been working with us for years based on the alignment of messaging and the connection he made with the entire group. Never have we had such positive feedback about a keynote speaker; David’s message was current and was what the team needed. Right place, right time = great results. We have already begun looking at other opportunities to engage with David over the next year to build on the great start at our annual conference. “I would like to take a moment of your time and offer my recommendation for David Irvine and Associates. David recently completed a full day presentation with a large group of Public Servants and Municipal Employees at ‘K’ Division Headquarters. David is a skilled presenter who holds an audience throughout his presentation. His topics are current, well thought out, and very enlightening for the people he is presenting to. You will find that his desire to give the best, most relevant information to his audience will shine through as he prepares and as he speaks. When he worked with us, for example, David contacted candidates in advance, learned what their concerns were, and moulded his material to provide what they needed at this time in their careers. “Thank you, David for your valuable contributions to the Oklahoma DHS LeadUP leadership development program. From initial contact to delivery, you provided us with a first class professional service. You listened carefully to our detailed needs and collaboratively crafted a program that was both relevant and impactful for our learning audience. “David has twice facilitated workshops for CRHC staff and for CRHC Managers. His impact over the two years created a more accountable, committed and authentic work culture. His ability to connect in a personal way to the people and work of CRHC has made an important and substantial difference. His style of planning and involving the organization to focus his expertise is unique and impressive. We are grateful he has honed and shared his leadership gifts with organizations like ours. 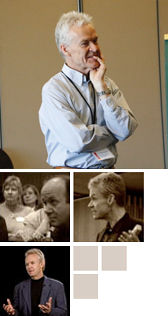 “”David Irvine presented at the Canadian Conference on Developmental Disabilities and Autism in April 2012. David is clearly knowledgeable and passionate about his topics and his delivery is authentic and engaging. He has a way of articulating his message through story-telling in a way that takes what might otherwise be an elusive topic and transforms it into a tool that is very relevant to your work and your personal life. “When we hear the word ‘accountability,’ sometimes fear, anxiety and pressure emerge! David’s work addresses the essential essence of transformational leadership … turning accountability from a negative to a positive, moving from an external sense of responsibility to an internal commitment, both professionally and personally.